Teach the Kids Important Skills to Respond to an Emergency :- Can be life saving. As we have seen an heard via the media. Tv and newspapers, etc have reported on cases when a child has appropriately phoned the Emergency services by dialling 999 within the Uk. The child has then been able to access appropriate Emergency assistance, whilst Emergency Call Handler can guide and support the child by talking to them by phone line until the Emergency staff arrive on scene. Care within the Community. It does seem wise to Educate, Inform and Update the Community. Children are part of our Community. Safety is an important issue. Being proactive by providing such information, and allowing individuals to build up skills which are essential in an Emergency is Caring, Practical and Wise. Picking Up After Themselves :- Seems Sensible, Responsible, Practical and Respectful. No one wants to stand on, trip over a toy, etc. Accidents do happen, but Health and Safety are Important Issues. So wise to be Respectful, Considerate, Proactive in Preventing Accidents whenever possible by behaving in a sensible, safe, respective manner. Manners matter. When I first saw the photo above :- I thought the blog may be about home security i.e. locks, etc. Then I thought of a term which was frequently used some years ago :- Latch Key Kids. Liking how you speak of Parenting / Caring for children being about preparing them for future role, aspects in life. We I believe should be allowing them to move from a degree of dependence towards Independece at their pace, meanwhile aiming to keep them safe and secure ( a sense of safety and security probably helps build confidence and self esteem). Whilst Independence is good, we do not live in isolation. Socialisation is important, as well as a sense of Community, being a Responsible citizen, etc. So much to learn and instill. Seems that a child needs to be raised, educated, and integrated into Community. Again whilst being Respected, kept safe and secure. It is a good idea to have an adequately stocked First Aid Kit/ box at home. As accidents and injuries do occur from time to time. Up to date First Aid information / course / book can all be beneficial. As it can be children who may an accident / injury talking them through how you are providing care for them. can be reassuring. As well as a learning experience: they will know what to expect if there is a next time. As they mature and learn, they may become knowledgeable and feel confident to provide such care to another. We learn as we live. Over time we can learn to self care, care for others, etc. 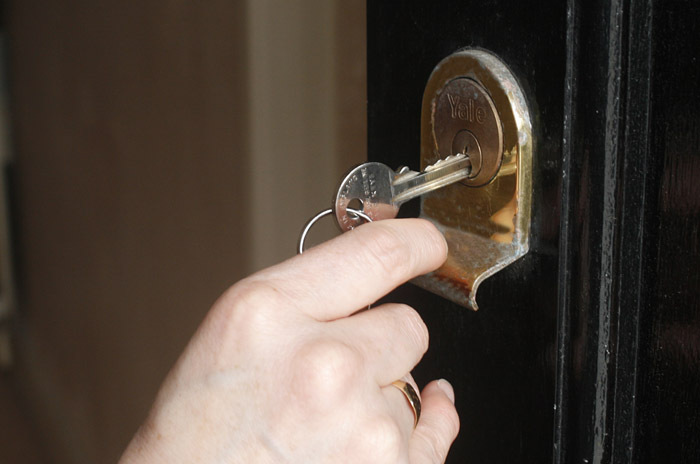 When to give your child a key to the door is an important topic to consider. Responsible and Respectful behaviour seem to be aspects to consider. Home Safety:- An element I believe that is important is Fire Safety/ Fire Prevention. I believe that in some areas there are Fire Safety Officer/s. Some are based in local Fire Station/s. They can provide up to date advice, etc. Seems essential to address Fire Safety / Fire Prevention when there is a family to consider. Safety in the Home can cover / address many aspects if / when fully considered. Security:- reliable, safe, secure doors, windows, locks, etc. Fire Safety. Accident Prevention, can be stair gates, keeping children safely away from hot cooker, hot pots, etc. So many Responsibilities. Yet we also need to consider each family member, as well as possible visitors. How do we access expert information, guidance, etc. Police may have Home Safety Officer, maybe Personal Safety Advice is available. As we are keen to ensure Safety within and outwith the Home. Children tend to have mobile phone/s, yet we hear and read of muggings for mobile phones. Sharing positive support experiences can benefit us in our attempts in maintaining safety.